Whether I knew it or not, I have been using design processes for my entire adult life. First, when I in my late teens and early 20’s, I was passionate about making music and sharing it with my peers. I recorded music that I had written, burnt CDs, and designed and printed the labels and album covers. These designs were very, very rough and, in hindsight, embarassing. The design of my early products was extremely poor and rushed. I hand-drew many of my early covers with pencil crayon; there was very little consistancy between copies of the same album. This is because the overall effect of my product did not really take the design of my packaging into consideration; my aesthics were very-much D.I.Y. punk-rock inspired. As I matured, and my tastes matured, I became more and more aware of the effects that packaging and design have on a consumer’s choice to either engage in a product or not. I started to see the entire object that I was putting into the world and not just the content contained within the media. When I was 24-25 years old, I released several more albums. These releases had packaging that tried to match the aesthetic of the music. Visual design became vitally important to the release of my future projects. 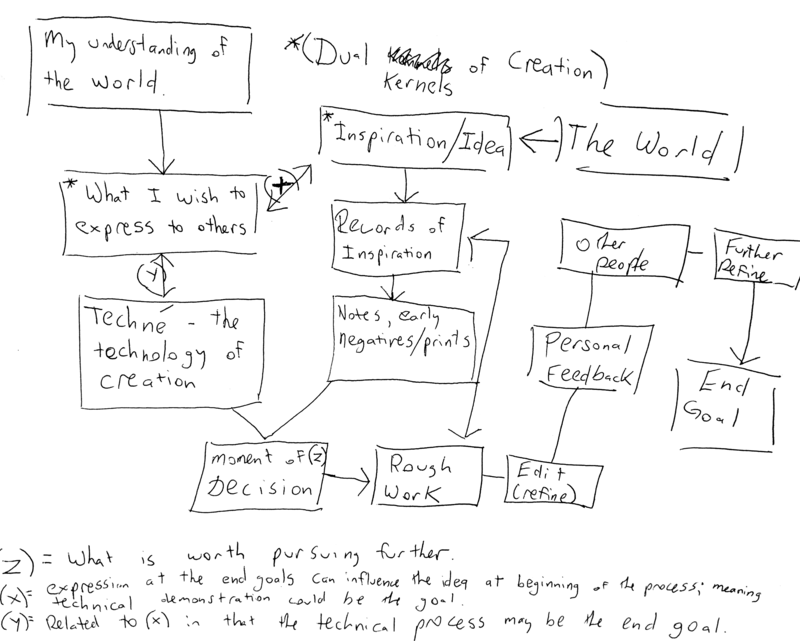 The design process shown above has been a part of my creative process since about this time. I was using a notebook for collecting ideas. I was documenting my output for future use and refinement. I started literary zine in Victoria in 2009 that very-much took design seriously and I began to use a computer for my cover design and layout. I began to search out fonts for use in my publishing. In the past five years, I began to take photography more and more seriously as an important part of my artist impulses. This, naturally as it is a visual medium, forced me to pay much more attention to the visual presentation of my art.